Marcel René Marburger studied Art History, German Literature, and Philosophy at the University of Cologne and did his PhD about the art theoretical relevance in Vilém Flusser’s writings. He was scientific assistant at the Academy of Media Arts in Cologne, co-curator at the Simultanhalle in Cologne, lecturer at the Academy of Fine Arts in Dresden, lecturer and research fellow at the University of Arts Berlin as well as scientific assistant at the University of Potsdam. From 2007 to 2010 he was the scientific supervisor of the _Vilém_Flusser_Archive. Since 2005 he has also been co-editor of the International Flusser Lectures. 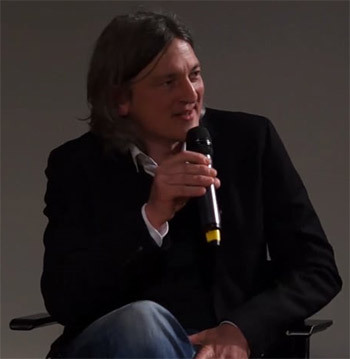 At present he is lecturer at the University of Arts Berlin and professor for Design Theory and Cultural Sciences at the Design Faculty of the University of Applied Sciences and Arts Dortmund. In Flusser’s biography as well as in his writings one can easily detect an alienation from a, let’s say, traditional and conservative dealing with science in general and the academic world in particular: There is a growing rejection of scientific writing and a growing sympathizing with unacademic essayistic writing. One well known climax of this development is his collaboration with Louis Bec creating the „Vampy“ as they called it – the Vampyroteuthis Infernalis, a work that Abraham Moles called philosophy-fiction. Parallel to this, Flusser’s aim is to replace objects in art exhibitions through communicological processes. Now, being an expert in communication, could that mean allready that he is thinking of himself as the artist of the future? Last not but least, he is talking about alternative realities that could arise from „zero dimension“, from the endpoint of his media chronological model, with the help of artists and, on the other hand, he writes in several letters that he wants to translate theory into practice – maybe as one of the artists who are creating these new and unexpected realities? This text focusing on Flusser’s conceptual commitment to the 12th Biennial of São Paulo is taken from the dissertation Flusser und die Kunst which examines the relevance of art and media theory in the work of Vilém Flusser. Between June 1972 and March 1973 Flusser tried to put into practice his ideas for an art exhibition. For this purpose he traveled through Europe and got in touch with numerous artists and theorists, such as René Berger and Abraham A. Moles. During this crucial period Flusser decided to leave Brazil. Major changes can also be identified in his thinking. Although he remained true to his communicational perspective aesthetics and art became increasingly important. In addition to this, some of his most relevant theoretical considerations about media can be traced back to this important period of his life.